A few weeks ago, I was preparing to teach the next installment of an apologetics study to the junior and senior high school students at my church. The scriptural focus of the lesson was the historical account of King Josiah, which is recorded in 2 Kings chapters 22 and 23, as well as 2 Chronicles chapters 34 and 35. I had not visited this episode of salvation history in a very long time (I confess that I camp out in the New Testament far more than the Old). Reading the account with fresh eyes, at this stage of my life was a blessing of particular magnitude, for multiple reasons. Josiah, at the tender age of 8 years old, inherited a kingdom in spiritual shambles. His father and predecessor, King Amon, had been a horrendously sinful idolater, just like Josiah’s grandfather, King Manasseh. But only eight years into his reign, as a youth of 16 years old, “Josiah began to seek the God of his ancestor David” (2 Chronicles 34:3). The Lord captured Josiah’s heart and four years later, a dramatic, cleansing rampage commenced. Idols were destroyed; altars to false gods were torn down, and the very bones of the idolatrous priests were burned on their own altars. Over a period of about six years, Josiah’s revolution swept Judah and Jerusalem, the cities of Manasseh, Ephraim, and Simeon, all the way to Naphtali and the surrounding shrines to false gods (2 Chronicles 34:3-7). Then came the point in his reign (the 18th year) that Josiah was ready to begin restoring the Lord’s temple. He summoned his court secretary, Shaphan, and told him to go to the temple and meet with the high priest, Hilkiah, the top-ranking temple authority. Shaphan was instructed to tell Hilkiah that the money brought into the temple was to be distributed to the carpenters, builders, and stone masons for the purpose of purchasing timber and stone for the massive restoration project. Apparently, some clean-up and repair was already in progress, because an artifact had just been discovered. The high priest Hilkiah says to Shaphan, “I have found the book of the law in the Lord’s temple” (2 Kings 22:8). Shaphan reads it, takes it back to the royal court, and reads it aloud in the presence of King Josiah. Josiah becomes distressed to the point of tearing his own robes in anguish over the failure of his forefathers and his current kingdom to observe all the detailed rites of proper holy worship and observance of the liturgical year. Josiah tells Shephan and Hilkiah, along with a few other men, “Go and inquire of the Lord for me, the people all all of Judah about the instruction in this book that has been found. For great is the Lord’s wrath that is kindled against us because our ancestors have not obeyed the words of this book in order to do everything written about us” (2 Kings 22:13). So what does this royal contingent, which includes both the King’s representatives and the highest ranking priest, proceed to do at this point? They immediately make a bee-line for a woman prophet named Huldah, who lived in the Second District of Jerusalem. 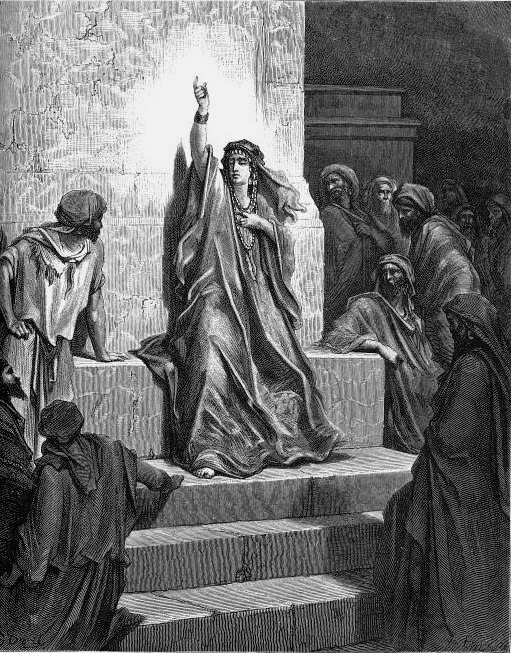 Getting back to our story, the Lord speaks through his anointed prophet Huldah. The divine message she communicates to the men is one of powerful warning of God’s wrath against the rampant idolatry of Judah. But because of Josiah’s tender heart, humility, and deep desire to please the Lord, the Lord says that Josiah will not see the terrible disaster and desolation that is to eventually come. Once Josiah received the report of Hulda’s prophecy, he gathered the people of his kingdom, including the priests and the other prophets. He read to them the covenant that had been found in the temple, and proceeded to renew the covenant with the Lord in the sight of all. Next, he continued his reforms of the land, cleansing the temple, tearing down high places of worship to false gods, smashing and burning altars. He even “slaughtered on the altars all the priests of the high places who were there, and he burned human bones on the altars” (2 Kings 23:20). 2 Kings 23:25 tells us that before Josiah, “there was no king like him who turned to the Lord with all his mind and with all his heart and with all his strength according to all the law of Moses, and no one like him arose after him.” Notice the echo of what Jesus proclaimed as the Greatest Commandment: “Love the Lord your God with all your heart and with all your soul and with all your strength and with all your mind (Luke 10:26). And to think that a woman prophet was instrumental in Josiah’s renewal of the covenant and the grand success of his theocratic reform. 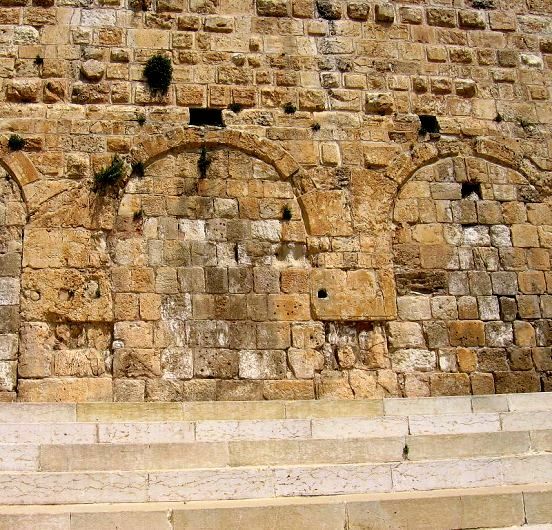 Huldah’s Gate in present day Jerusalem. 2. A stone from the original gate of Huldah, a stone which happens to be the only surviving remnant of the original entrance to the temple!